The Stardust spacecraft used a grid holding aerogel to capture dust particles from comet Wild 2. In this test, high velocity dust particles are stopped unharmed at the end of cone shaped tracks in a sample of aerogel. Like discarded lumber and broken bricks around a construction site, comets scattered at the edge of our solar system are left-over bits from the "construction" of our solar system. Studying comets, then, can help scientists understand how our solar system formed, and how it gave rise to a life-bearing planet like Earth. But comets have long been frustratingly out of reach -- until recently. In January 2004 NASA's Stardust probe made a fly-by of the comet Wild 2 (pronounced "vilt"). This fly-by captured some of the best images and data on comets yet ... and the most surprising. "Now we think the comet's surface might have a texture like freeze-dried ice cream, so-called 'astronaut ice cream': It's solid and can assume odd, gravity-defying shapes, but it's basically soft and crumbles easily," says Donald Brownlee of the University of Washington, principal investigator for Stardust. Scientists are currently assembling a 3-D computer model of this surface from the photos that Stardust took. Those photos show the sunlit side of the comet from many angles, so its 3-dimensional shape can be inferred by analyzing the images. The result will be a "virtual comet" that scientists can examine from any angle. They can even perform a virtual fly-by. Using this 3-D model to study the comet's shape in detail, the scientists will learn a lot about the material from which the comet is made: how strong or dense or brittle it is, for example. Open an old astronomy textbook. The basic sketch you'll find there of galaxy formation is fairly simple: a vast cloud of diffuse hydrogen and helium gas condenses under gravity, and dense spots in the cloud collapse to form stars. Voila! A galaxy. But real galaxies are much more complex than that. A galaxy is a swirling "soup" of billions of stars and roaming black holes, scattered clouds of gas and dust, random flashes of star birth and exploding supernovas, and an unseen and mysterious substance called "dark matter." Over time, all these ingredients mix and interact—pulling and compressing and colliding—and somehow that interplay leads to the galaxies we see today. No wonder it's such a hard problem to solve! Just over one year into its three-year mission, GALEX is already shedding some new light on the problem. "Some of the discoveries GALEX has made will change our understanding of how galaxies develop and when, where, and why stars form in galaxies," says Peter Friedman, a researcher at Caltech and Project Scientist for GALEX. 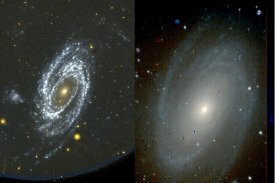 This small space telescope, called the Galaxy Evolution Explorer (GALEX for short), makes its discoveries by taking pictures of millions of galaxies scattered over the whole sky. Some of these galaxies are close by (at least by astronomical standards of "close"), while others are as much as 10 billion light-years away. Because light takes time to travel through space, we see these distant galaxies as they appeared billions of years ago. 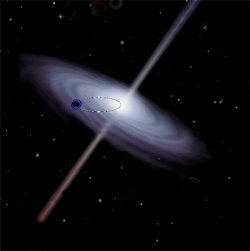 Comparing young galaxies from the distant past with older, modern galaxies will teach scientists about how galaxies change over time. Two cameras on MISR made these images of the same part of the Mojave Desert. The camera pointed at an angle of 26 forward saw the flashes from two solar electric power generating stations. These objects are nearly invisible at the other angle. Erin Schumacher's summer job for NASA was to look for UFOs. Erin is a 16-year-old high school student from Redondo Beach, California, attending the California Academy of Mathematics and Science in Carson. She was one of ten students selected to work at NASA's Jet Propulsion Laboratory (JPL) in Pasadena as part of the Summer High School Apprenticeship Research Program, or SHARP. But is studying UFOs a useful kind of NASA research? Well, it is when they are "unidentified flashing objects" that appear in certain images of Earth from space. 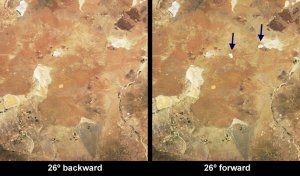 Erin worked with scientists on the Multi-angle Imaging SpectroRadiometer (MISR) project to track down these mysterious features. MISR is one of five instruments onboard the Earth-orbiting Terra satellite. MISR's nine separate cameras all point downward at different angles, each camera in turn taking a picture of the same piece of Earth as the satellite passes overhead. Viewing the same scene through the atmosphere at different angles gives far more information about the aerosols, pollution, and water vapor in the air than a single view would give. 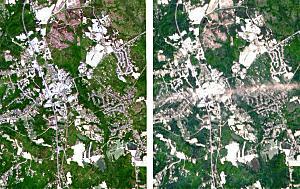 Ground features may also look slightly or dramatically different from one viewing angle to another. 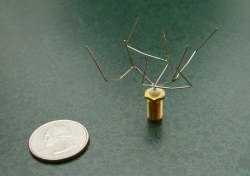 The evening of June 30, 2004, was nail-biting time at Cassini Mission Control. After a seven-year journey that included gravity assist flybys of Venus, Earth, and Jupiter, Cassini had finally arrived at Saturn. A 96-minute burn of its main engine would slow it down enough to be captured into orbit by Saturn's powerful gravitational field. 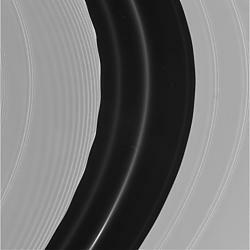 Too short a burn and Cassini would keep going toward the outer reaches of the solar system. Too long a burn and the orbit would be too close and fuel reserves exhausted. According to Dave Doody, a Cassini Mission Controller at the Jet Propulsion Laboratory (JPL) in Pasadena, California, there was a good chance the Earth-bound Cassini crew would have to wait hours to learn whether or not the burn was successful. Of the three spacecraft-tracking Deep Space Network (DSN) complexes around the globe, the complex in Canberra, Australia, was in line to receive Cassini's signal shortly after the beginning of the burn. However, winds of up to 90 kilometers per hour had been forecast. In such winds, the DSN's huge dish antennas must be locked into position pointed straight up and cannot be used to track a tiny spacecraft a billion miles away as Earth turns on its axis. "The winds never came," notes Doody. The DSN complex at Goldstone, California, was tracking the carrier signal from Cassini's low-gain antenna (LGA) when the telltale Doppler shift in the LGA signal was seen, indicating the sudden deceleration of the spacecraft from the successful ignition of the main engine. Soon thereafter, however, Goldstone rotated out of range and Canberra took the watch. Radiation storms, 250 mile-per-second winds, charged particles raining down from magnetic tempests overhead ... it sounds like the extreme weather of some alien world. But this bizarre weather happens right here at Earth. 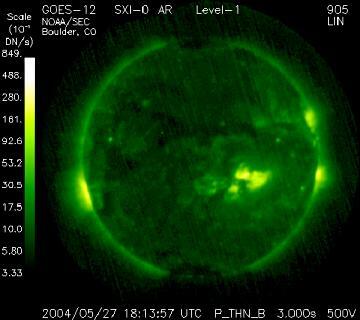 Scientists call it "space weather." It occurs mostly within the gradual boundary between our atmosphere and interplanetary space, where the blast of particles and radiation streaming from the Sun plows into the protective bubble of Earth's magnetic field. But space weather can also descend to Earth's surface. Because the Earth's magnetic field envelops all of us, vibrations in this springy field caused by space weather reverberate in the room around you and within your body as much as at the edge of space far overhead. In fact, one way to see these "geomagnetic storms" is to suspend a magnetized needle from a thin thread inside of a bottle. When solar storms buffet Earth's magnetic field, you'll see the needle move and swing. If you live at higher latitudes, you can see a more spectacular effect: the aurora borealis and the aurora australis. These colorful light shows happen when charged particles trapped in the outer bands of Earth's magnetic field get "shaken loose" and rain down on Earth's atmosphere. And because a vibrating magnetic field will induce an electric current in a conductor, geomagnetic storms can have a less enjoyable effect: widespread power blackouts. Such a blackout happened in 1989 in Quebec, Canada, during a particularly strong geomagnetic storm. These storms can also induce currents in the metallic bodies of orbiting satellites, knocking the satellite out temporarily, and sometimes permanently. A new space telescope called LISA (short for "Laser Interferometer Space Antenna") aims to find out. Designed by scientists at NASA and the European Space Agency, LISA doesn't detect ordinary forms of electromagnetic radiation such as light or radio waves. It senses ripples in the fabric of space-time itself--gravitational waves.